Despite what you may think after seeing Toy Story 3, most local churches or preschool programs are thrilled to receive your gently used toys and supplies and your child’s play thing will be no less loved for having been donated. This may be one of the easiest ways to involve your small children in summer acts of service. Although it will take a bit of psychological work on your part. Choose a day to go through your child’s toys and let them know ahead of time what you will be doing. Explain to your toddler/preschooler that there are schools in the area that would be tremendously blessed to have new toys to play with. Perhaps your child has been to a local preschool or mother’s day out and understands the excitement that comes with new toys. Spend some time sharing with your child and preparing his/her heart of generosity. Do not be surprised when the idea of giving away a beloved toy is met with opposition. This should be expected. Simply take some time to redirect your child’s thoughts. This is an important life-lesson and it can begin here and now. Involve your child in the process of choosing which toys to donate. Pick 5 toys to donate and allow them to put 2 back. This will help them feel a bit more in control rather than having toys taken away with no say. Put all of the toys/supplies you’ve chosen to donate into a box. Plan a time to visit the church or school and drop off the toys. If they are able, allow your child to present the toys so they can feel the pride of giving part of themselves to make another child happy. This simple act of service not only gives back to your local community, it teaches your little one to give of themselves and helps you purge your overflowing play areas. A win/win summer act of service! Submitted by Jessica Wolstenholm, blogger and author of The Pregnancy Companion and The Baby Companion books. You can connect with Jessica at graceformoms.com where she encourages moms to grab hold of grace in the midst of the joys and craziness of motherhood. Love to serve with your kids? Do you have a favorite service/ministry project that your family does together? We’re featuring your service ideas for a summer of giving back. Submit a short guest post in our easy form HERE. 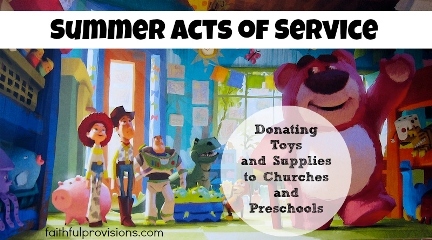 See all the great ideas for Summer Acts of Service on Faithful Provisions.